This article is about the American druggist. For other people named John Pemberton, see John Pemberton (disambiguation). John Stith Pemberton (July 8, 1831 – August 16, 1888) was an American pharmacist who is best known as the inventor of Coca-Cola. In May 1886, he developed an early version of a beverage that would later become world-famous as Coca-Cola, but sold his rights to the drink shortly before his death. Pemberton was born on July 8, 1831, in Knoxville, Georgia, and spent most of his childhood in Rome, Georgia. His parents were James C. Pemberton and Martha L. Gant. He entered the Reform Medical College of Georgia in Macon, Georgia, and in 1850, at the age of nineteen, he earned his medical degree. His main talent was chemistry. Shortly thereafter, he met Ann Eliza Clifford Lewis of Columbus, Georgia, known to her friends as "Cliff", who had been a student at the Wesleyan College in Macon. They were married in Columbus in 1853. Their only child, Charles Ney Pemberton, was born in 1854. They lived in a Victorian cottage, the Pemberton House in Columbus, a home of historic significance which was added to the National Register of Historic Places on September 28, 1971. After initially practicing some medicine and surgery, Dr. Pemberton opened a drug store in Columbus. During the American Civil War, Pemberton served in the Third Cavalry Battalion of the Georgia State Guard, which was at that time a component of the Confederate Army. He achieved the rank of lieutenant colonel. In April 1865, Dr. Pemberton sustained a saber wound to the chest during the Battle of Columbus. He soon became addicted to the morphine used to ease his pain. In 1866, seeking a cure for his addiction, he began to experiment with painkillers that would serve as morphine-free alternatives to morphine. His first recipe was "Dr. Tuggle's Compound Syrup of Globe Flower", in which the active ingredient was derived from the buttonbush (Cephalanthus occidentalis), a toxic plant that is common in Alaska. He next began experimenting with coca and coca wines, eventually creating a recipe that contained extracts of kola nut and damiana, which he called Pemberton's French Wine Coca. According to Coca-Cola historian Phil Mooney, Pemberton's world-famous soda was "created in Columbus, Georgia and carried to Atlanta". With public concern about drug addiction, depression, and alcoholism among war veterans, and "neurasthenia" among "highly-strung" Southern women, Pemberton's "medicine" was advertised as particularly beneficial for "ladies, and all those whose sedentary employment causes nervous prostration". In 1886, when Atlanta and Fulton County enacted temperance legislation, Pemberton had to produce a non-alcoholic alternative to his French Wine Coca. Pemberton relied on Atlanta drugstore owner-proprietor Willis E. Venable to test, and help him perfect, the recipe for the beverage, which he formulated by trial and error. With Venable's assistance, Pemberton worked out a set of directions for its preparation. He blended the base syrup with carbonated water by accident when trying to make another glassful of the beverage. Pemberton decided then to sell this as a fountain drink rather than a medicine. Frank Mason Robinson came up with the name "Coca-Cola" for the alliterative sound, which was popular among other wine medicines of the time. Although the name refers to the two main ingredients, because of controversy over its cocaine content, The Coca-Cola Company later said that the name was "meaningless but fanciful". Robinson hand wrote the Spencerian script on the bottles and ads. Pemberton made many health claims for his product, touting it as a "valuable brain tonic" that would cure headaches, relieve exhaustion, and calm nerves, and marketed it as "delicious, refreshing, pure joy, exhilarating", and "invigorating". A sign in Knoxville, Georgia, commemorating John Pemberton. Soon after Coca-Cola hit the market, Dr. Pemberton fell ill and nearly bankrupt. Sick and desperate, he began selling rights to his formula to his business partners in Atlanta. Part of his motivation to sell was that he still suffered from an expensive continuing morphine addiction. Pemberton had a hunch that his formula "some day will be a national drink", so he attempted to retain a share of the ownership to leave to his son. However, Pemberton's son wanted the money, so in 1888, Pemberton and his son sold the remaining portion of the patent to a fellow Atlanta pharmacist, Asa Griggs Candler, for US$1,750. The grave of John Pemberton in Columbus, Georgia. 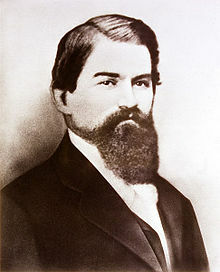 John Pemberton died from stomach cancer at age 57 in August 1888. At the time of his death, he also suffered from poverty and addiction to morphine. His body was returned to Columbus, Georgia, where he was buried at Linwood Cemetery. His grave marker is engraved with symbols showing his service in the Confederate Army and his membership as a Freemason. His son Charley continued to sell his father's formula, but six years later Charles Pemberton died after having become an opium addict. The animated television series Futurama had an episode titled "The Deep South" (2000), in which a man resembling Pemberton, and referred to as "the guy who invented Coca-Cola", is chosen as one of the few people allowed to leave the city of Atlanta, just before it sinks into the Atlantic Ocean. In 2010, the Coca-Cola Company paid tribute to Pemberton as a key character in an advertising campaign called "Secret Formula". Centered on the secret ingredients of Coca-Cola, imagery related to Pemberton was used to make people more aware of Coke's history and mythology. In 2013, Pemberton was portrayed by Bill Hader in the "Atlanta" episode of Comedy Central's Drunk History, created by Derek Waters. Welsh rock band Manic Street Preachers have an album track on their Know Your Enemy album called "Freedom of Speech Won't Feed My Children". The song, which could be viewed as a sarcastic anti-American rant, contains the line 'J.S. Pemberton saved our lives'. In the Fallout video game series, the soft-drink Nuka-Cola (based on Coca-Cola) was invented by a man named John-Caleb Bradberton. The name comes from an amalgamation of John Pemberton and Pepsi creator Caleb Bradham. The character's look and mannerisms are based on both men. ^ a b c d Historical Inventors — John S. Pemberton — Coca-Cola. Lemelson-MIT Program. Retrieved 2018-12-20. ^ King, Monroe M. "John Stith Pemberton (1831-1888)." New Georgia Encyclopedia. 13 June 2017. Web. 11 September 2017. ^ National Park Service (March 15, 2006). "National Register Information System – Pemberton House (#71000283)". National Register of Historic Places. National Park Service. Retrieved 2018-12-20. ^ Richard Gardiner, "The Civil War Origin of Coca-Cola in Columbus, Georgia", Muscogiana: Journal of the Muscogee Genealogical Society (Spring 2012), Vol. 23: 21–24. ^ John McKay, It Happened in Atlanta (Morris Books, 2011), 36. ^ Jeremy Agnew, Alcohol and Opium in the Old West, 173. ^ Dominic Streatfeild, meth: An Unauthorized Biography, Macmillan (2003), p. 80. ^ John Shelton Reed, Minding The South, University of Missouri Press (2099), p.171. ^ American Soft Drink and the Company that Makes It, Basic Books: enlarged 2nd edition (2000), p.24. ^ "Is This the Real Thing? Coca-Cola's Secret Formula "Discovered" by This American Life – TIME.com". TIME.com. ^ a b "For youth God, Country and Coca-Cola". google.com. p. 34. ^ Pendergrast, Mark (2000). "The tangled chain of title". For God, country, and Coca-Cola: the unauthorized history of the great American soft drink and the company that makes it (2nd ed.). New York: Basic Books. pp. 34–46. ISBN 978-0465054688.